Any thoughts or suggestions for getting the inner portion of the bar end weights out. I have been trying for about 20 minutes on the first one and it will not budge (using a hammer and a couple fender washers on the allen bolt but zero movement). Guzzi didn't weld them in or anything like that did they? Can you mount it using the bar-end weight's bolt...leaving the inner portion in place? I think it's part of the bar, might also be wrong too. I seen other Guzzi bars that it doesn't come out. What bike? Having taken WAY to long to do what you're trying to do on a Triumph t100 I chose NOT to do it again on my '18 V7III Carbon Shine. I didn't want to cough up $275 for oem M/G bar ends so went with a black Bikemaster Superbike bar ($29.00 delivered). It's a 98% match to the oem bar with hollow ends. Can't tell the difference riding. The 3 day delivery time was worth not doing the inner weights a 2nd time. Then went with CRG Lanesplitter bar ends. They're round like the headlight & fold. ($200 pr). Not quite the same cost as oem mirrors but I wanted a black bar & round mirprs. replace the mounting fasteners for the mirror with bolts and fasteners that match the bar ends. This could entail drilling and cutting the mirror mounts or adding rubber shims and inserts around the bolts to snug them in. BTW- I got a really nice pair of aluminum barend mirrors for my V11 Sport from Ebay for about $20. I bought some stamped sheet metal Emgo mirrors for $30 that vibrated so bad I couldn't use them. This was all to replace the CRG lane splitters that had "drooped" over time. Those cheap Chinese mirrors seem better in every way. As you have figured out, they ain't coming out! Can't you just re-use the bar end weight bolts with the bar end mirrors? Or is the diameter and dish of the bolt head wrong? 5 sets of CRG Lanesplitters, different bikes, never "drooped." Probably an installation issue. well put some miles on them and see what happens. When I say "drooped", I mean they lay back when traveling in the wind. The springs wear out and they won't stay in adjustment. So they droop back in the airflow. So rather than spend $75 on a new pair that would fail, I found some much better mirrors for a lot less money. try a BFH and drive it in?? I'm not sure how your bar ends work, but I have seen a lot of them with a split wedge which expands to tighten up inside the bar when the bolt is tightened. If these are those, screw a bolt into them a few turns, then strike a "small but sharp" blow on the bolt end to separate the wedge parts and they should pull right out. Hi Low Ryter-not trying to be antagonistic BUT have had the CRG's through a lot of miles & yrs & again, no drooping. Price can be a consideration & if you've found something from China that works for you that's what matters. Personally, I try to avoid Chinese products. The bar plugs don't come out. As mentioned above, and in many threads on this subject, discard the expanding crap that comes with the mirros and just bolt the mirror to the bar. Finally got me a Griso! Life is too short to go slow! 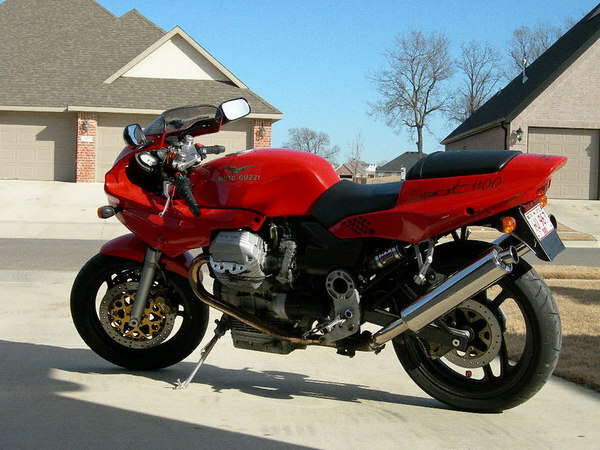 I did the same on the Breva 750. They were very secure when done that way. The best part of riding a motorcycle is to tilt the horizon and to lift the front coming out of a corner and to drift the back end powering thru loose dirt and to catch a little air topping a hill and... yeah it's all good! Dropping CRGs? Likely the ball has worn. All parts for CRGs are available - check with bevelheaven.com. The inner bar hardware expands. The outer hardware clamps. There is no spring. Still having an issue understanding what you all are saying. Have now ordered 3 different mirrors and they all won't work. I have zero interest in the Lane Spliters as they widen the bike far too much for my garage. Nothing I have ordered comes close to fitting with the weird design guzzi did. we are saying that you might have to modify the mirror or hardware by cutting, hack sawing, filing or drilling. Basically, you want to use the existing hardware in the bars and then modifying the mirrors and fasteners to fit. No way to do it on any of the mirrors I have gotten save drilling out the stupid set up (then making the stock bar ends not so easy to reinstall) or buying a new bar and swapping things over to it. Pita to me for something I just wanted to try out for a bi and see if I can live with it. I can't envision your situation. I am not proposing reusing the old bar-ends, I am suggesting that you modify the mirrors, bolts or fasteners to fit the hardware that's already stuck in the bars. In the past, I have hacksawed the mounting points on the mirrors and used different sized mounting bolts and snug them up with inserts. I haven't drilled out new mirrors to put in larger bolts but can imagine doing it. Also, as I stated earlier, I've not had the best luck with lane splitter mirrors holding up over time. It's seems after you fold them back and forth over 15k miles or so that they don't hold adjustment. Someone pointed out that you can purchase new hardware to repair them and that runs about $20. I have had good luck with the fixed aluminum bar end mirrors I purchased and posted a link for. And yes, I had to modify the fasteners for those because the old expandable Lane Splitter inserts were stuck in the bars. BTW, I have a box of mirrors & fasteners that I have collected over time. So I've mixed and matched a lot. Finally, once you have bar end mirrors mounted, I'd recommend that you keep the right size allen wrench in the tank bag in case they come loose. I had to stack washers to make spacers. You might need to put on a white dress shirt and narrow dark tie. Then find a pocket protector and put in a technical pencil and a tire gage. That should do it, cause being an "Enginerd" help make these things work. Oh benebob, by now I'm really feeling for you. Again, I might have missed it. What bike are you attempting this mod on & what width do you have available in your garage? So many options here. If you'd care to talk to someone with a simple, 30-45 minute solution that works . Feel free to PM me, I'll offer my phone # or I'll call you. If not, I wish you well.